2 Tension Rods - Adjust Castor and replace the large worn out Nissan bush *Geomaster tension rods optional. 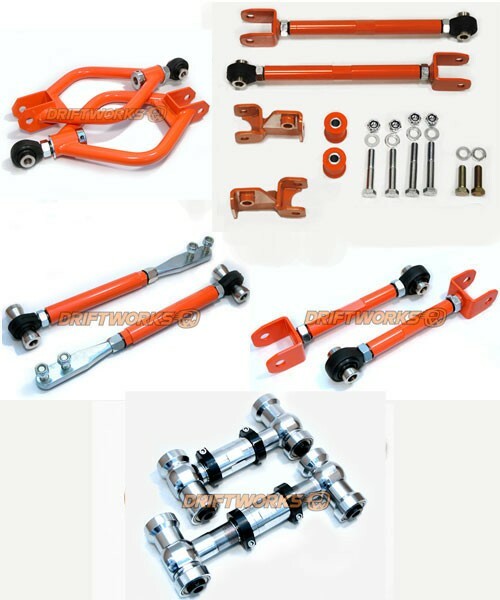 HICAS removal kit - Adjust your rear toe correctly on lowered cars and remove worn Nissan bush, remove and lock out HICAS. Driftworks adjustable tension rods allow you to accurately set the caster angle of the front suspension and dramatically improve steering response and feel. By using a high load spherical bearing they eliminate all the play that the huge liquid filled standard bushes cause. Tying the front end together properly and dialling in more caster angle works together to transform the feel of the car. 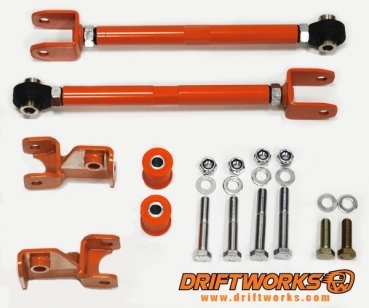 Driftworks adjustable camber control arms with sperical bearings allow you to accurately set your rear camber. A must for any lowered car, as the standard eccentric bolt doesn't allow enough adjustment. Correct alignment is essential for any car, be it to reduce tyre wear or dial in the perfect geometry for a fast road, track or drift setup. Driftworks Hicas Eliminator, completely replaces the weak and problematic Hicas system. While the standard setup is adjustable, the Hicas rear wheel steering system makes the car unpredictable for fast road and track use. The next issue if you lock out the standard Hicas rack is that all the original components are designed to have the rack as a 'damper', so all the under-sized expensive oem balljoints wear out quickly. The Hicas Eliminator replaces the entire system with heavy duty toe rods and brackets to convert the subframe to a non-Hicas style setup. 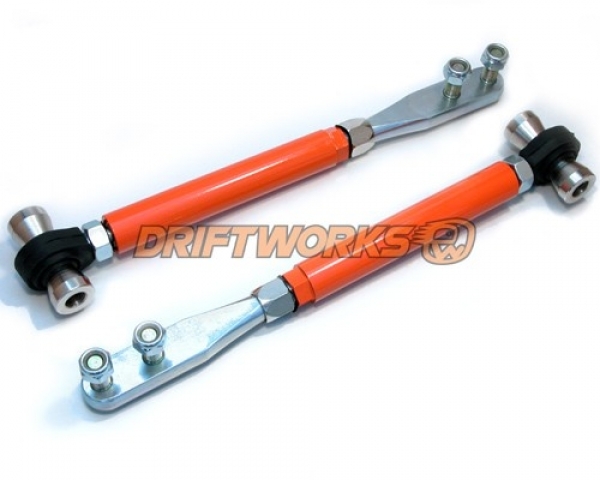 Driftworks adjustable traction rods, replace the standard non adjustable Nissan part. It is the final adjustable arm needed on R32 rear suspension set up. Adjusting this arm's length decides how much toe is given to the rear wheel under suspension compression. They also eliminate another of the unwanted standard rubber bushes from the rear suspension setup, once again contributing towards that perfect handling car. 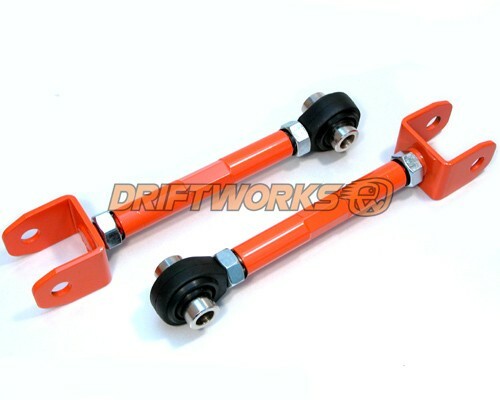 Driftworks adjustable front upper camber arms allow you to accurately set the front camber angle, either to dial out excessive tyre wear or set your car to the perfect geometry settings for your application. They also replace worn standard rubber bushes with solid bearings, dramatically improving suspension feel and response. Whatever you're doing with the car, they're an essential extra, allowing you to get the car set up just right.